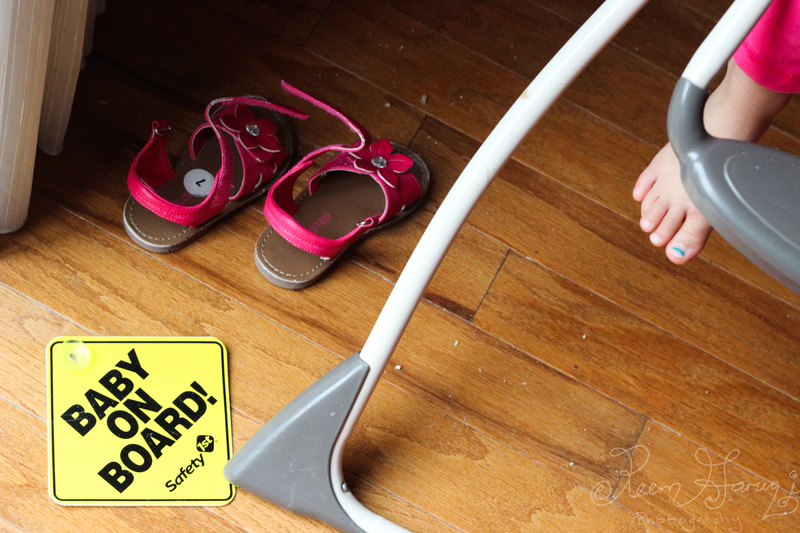 I remember feeling confident that morning as I struggled to pull baby A’s little stretchy jeans over her jiggly legs. With Z, I used to dread her pediatrician appointments, or her big ‘weigh-ins.’ Z is like me, petite by nature, so she was met by scrutiny when she gained weight very slowly. However, she would gain weight, just slowly, so once it was accepted that she was like me, and just gained weight slowly, her pediatric appointments went smoother. Baby A has never had the weight problem, and is a joy to put on the scale as we watch her numbers comfortably fit in the percentile. Baby A’s 4 month appointment went pretty smoothly except that when the pediatrician felt her head, said that baby A’s head was asymmetric and that she wasn’t looking as well to the right, and that she’d need Therapy, but not to worry, it’s nothing. The ‘Th’ word. For some reason ,when I hear the word Therapy, images are conjured in my mind of worst-case-scenarios. I went home to Google torticollis and plagiocephaly and saw a Support Group for Mothers of Infants with Torticollis and Plagiocephaly. Huh? I thought. The pediatrician said it was nothing, but Google and aforementioned Support Group suggested otherwise. Therapy means appointments for baby A at CHOA – Children’s Hospital of Atlanta. It means stretches of her neck to activate a weaker muscle. It means lessening a head tilt, a tilt I never noticed prior to 4 months of her life. It means Friday time being allotted to Therapy. It means an hour of her crying at CHOA every week while she receives therapy. 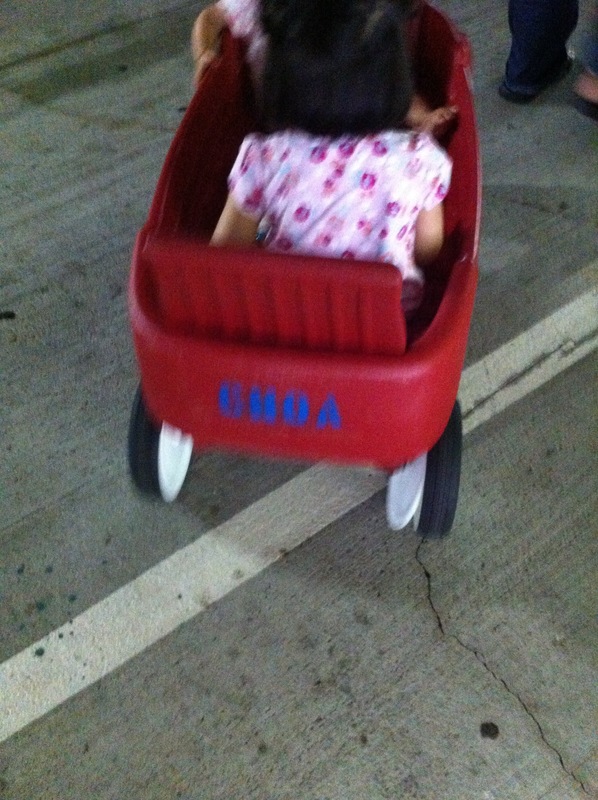 It means lugging red CHOA wagons with a toddler and infant through elevators and parking decks. It may mean sitting through Rush Hour Traffic in Atlanta if therapy falls into a non-traffic-friendly-hour. It means being appreciative of the muscles that do work. 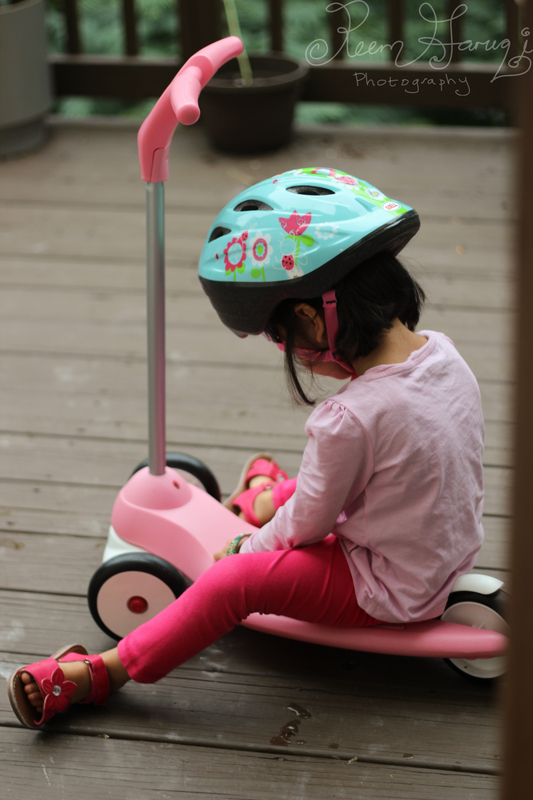 Therapy means being faced with the question of Should we get a helmet or not for baby A? It means waiting rooms, being put on hold, and then being transferred, and being put on hold again. It means big words such as The Office of Orthotics and Prosthetics where I looked up to see a man walking through holding a child sideways, only to realize he was holding a Prosthetic Plastic leg, no child. Anyways, after a lot of thought, consultation, and an insurance plan that came through, baby A got a helmet to help with her head assymetry and reshaping. 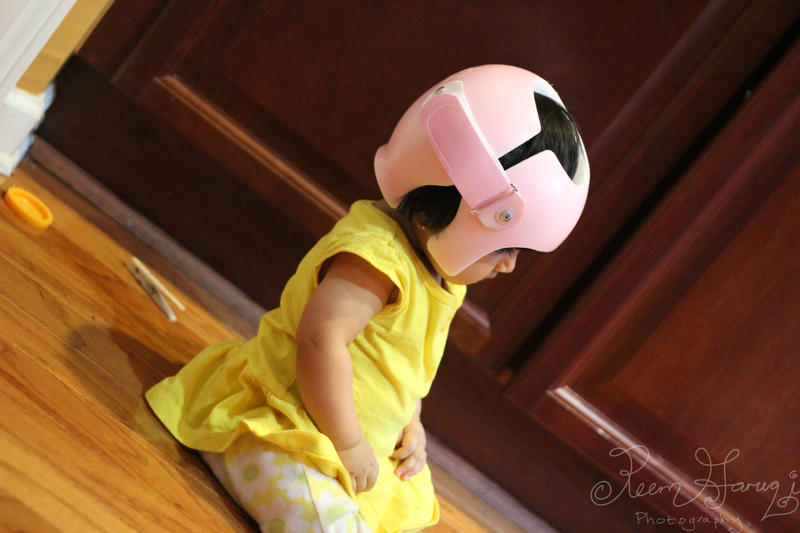 There is a really good (reassuring-informative) blog by another mother with helpful information on plagiocephaly and torticollis here at My Helmet Baby (Squared). 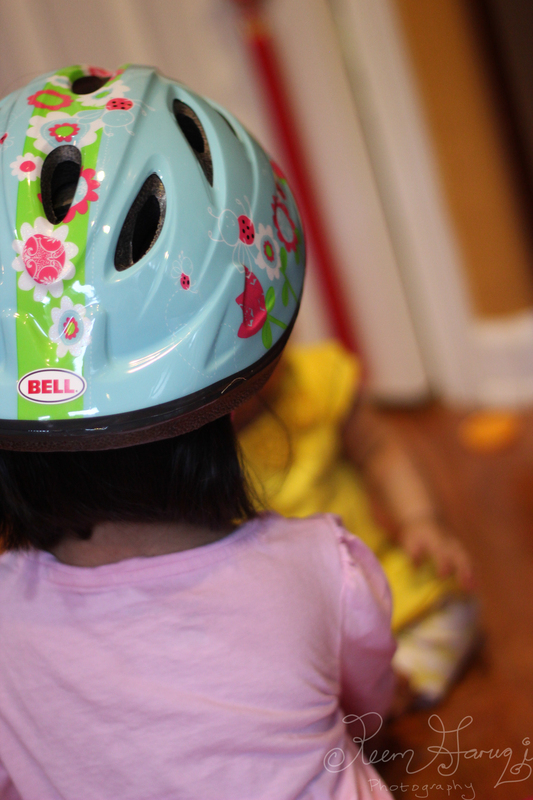 Baby A breaking in her new helmet; it’s worn for just a little bit until 23 hours a day! Of course Z wanted to wear her helmet too. a great prayer, dua that I love. 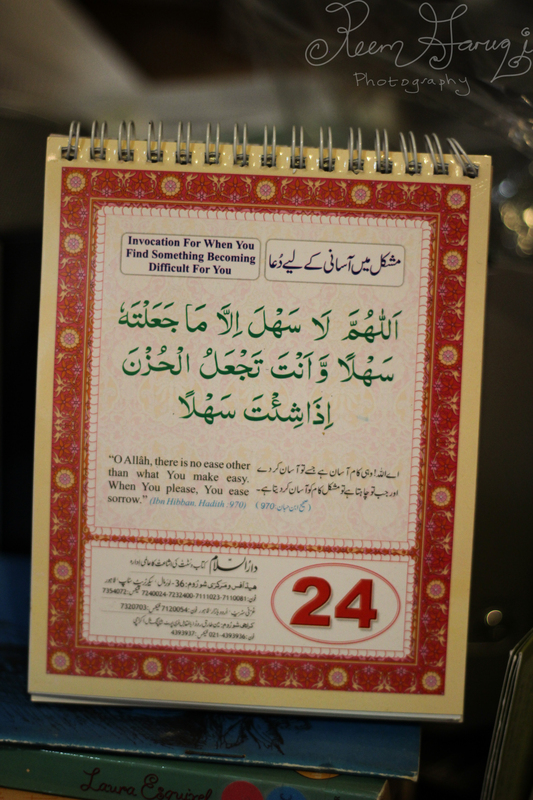 I keep this calendar on the 24th, because I love this dua. 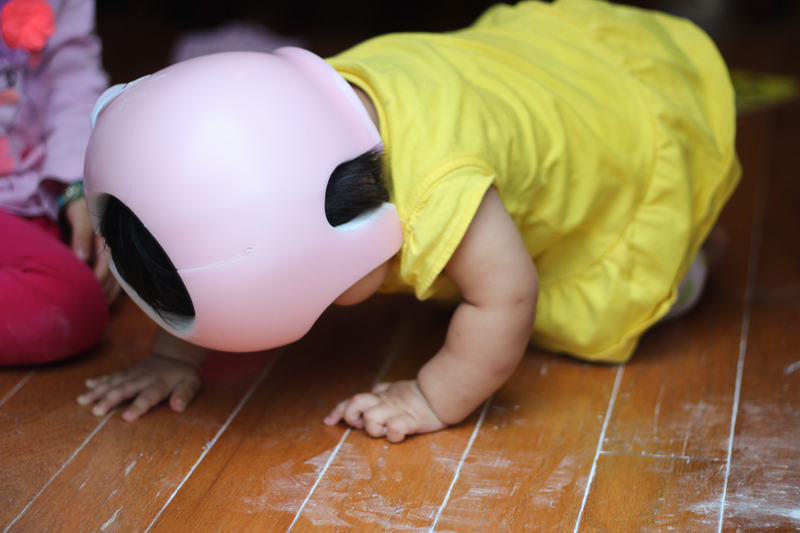 So baby A just learned to crawl – totally changes the dynamics of my house. She finds all the things she’s not supposed to find on the floor, and tries to get in all of Z’s toys. Z is having to run around now. I don’t know what to do with myself! (The white stuff is baby powder. Ants don’t like it). 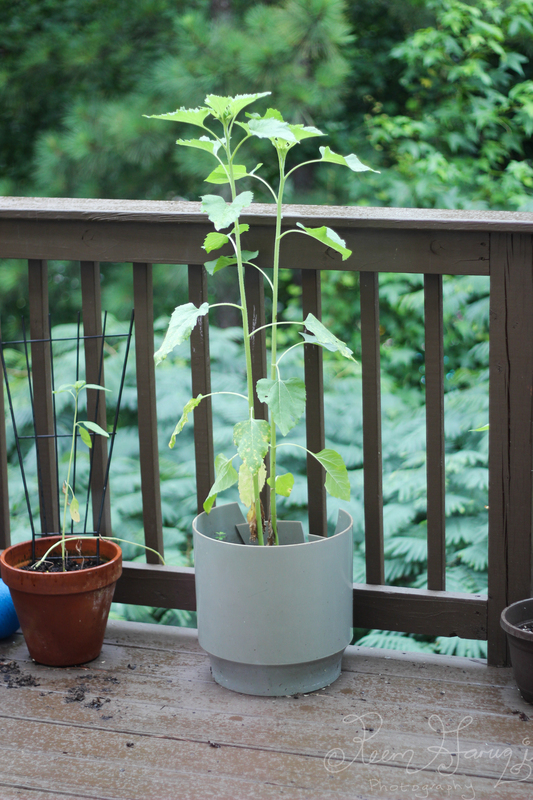 This should be called rainflower, not sunflower, because it’s rained. So. much. Yesterday marked the first day of the month of Ramadan for Muslims all around the world, and for me also the first day of Baby A’s helmet. Praying that this month brings plenty of blessings for all of us, and lots of ease for baby A and for all the people who aren’t feeling 100% in this world, especially children! 8 month old with helmet, blog about plagiocephaly, blog about torticollis, children hospital of atlanta therapy, how to plant sunflower seeds, how to treat plagiocephaly, how to treat torticollis, should I get a helmet for my baby? SubhanAllah! It must be overwhelming for you. But alhamdulilah otherwise she is healthy. May Allah protect her. thanks :)! ramadan mubarak to you too!